Mackinac Island and the Straits of Mackinac have always been a very popular Great Lakes Boating destination. Mackinac Island is readily accessible via private watercraft from a number of northern Michigan ports. 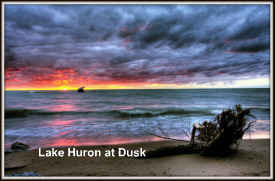 Located at the intersection of Lake Michigan and Lake Huron, the Straits area has three large marinas providing a variety of services to transient pleasure craft. 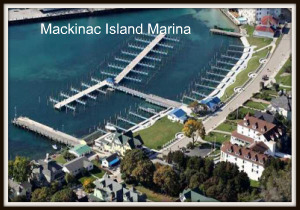 Mackinac Island State Dock has 70 transient slips, pumpout, 30 amp elec., gas & diesel, water, cable TV, internet, heads, showers, laundry, swimming pool & whirlpool, recreation area, grills, picnic tables, dog walk. Phone 906-847-3561. 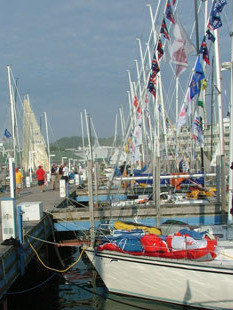 The Mackinac Island Yacht Club is located directly across the street. 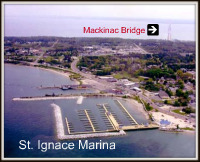 St. Ignace Public Marina has 136 slips, state-of-the-art facility, pumpout, 30 & 50 amp elec., 200 amp for large slips, gas & diesel, water, cable TV, internet, wells up to 120 ft., 24-hour security, heads, showers, laundry, grills, picnic tables, dog run. Phone 906-643-8131 or 800-447-2757. 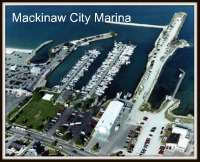 Mackinaw City Marina has 78 transient slips, pumpout, 30 & 50 amp elec., gas & diesel, water, cable TV, internet, heads, showers, laundry, swimming pool & whirlpool, rec area, grills, picnic tables, dog walk. Click here for reservations for moorings at these Great Lakes boating marinas. Hazelton Street – four boat ramps, a protected breakwall, paved parking, fish cleaning station and restrooms. City Dock #3 – one double-wide ramp, a protected breakwall, paved parking, restrooms, picnic area with grills, pavilion, playground. There are two historic Great Lakes sailing races that all boaters love to follow each summer - the famous Chicago Mackinac Race and the Bayview Mackinac Race. It's a great time to be on the Island when these sailors are in town! Your Great Lakes boating journey can encompass over 10,900 miles of coastline including Canada’s border and with the U.S. border being around 3,288 miles. The Great Lakes are really inland seas and have one-fifth of the world’s fresh surface water within its shores. If you love antique wooden boats then you will want to plan a boating excursion to the Annual Antique Wooden Boat Show in the beautiful Les Cheneaux Islands which is a northern Michigan boating paradise. 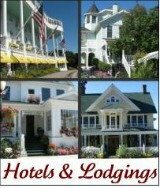 There are many different choices for lodging including many quaint bed and breakfasts on the Island. Marcia and Kathy’s top six Mackinac Island hotels are great choices for weary boaters wanting some top notch amenities to sooth their bodies. Of course there is always the five star and historic Grand Hotel which is one of the top hotel resorts in the world. If you are staying just for the day there are many Mackinac Island restaurants walking distance from the marina. You can rent bikes for a few hours in order to explore the Island by following the road around it or to travel inland to see its natural beauty. 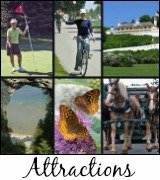 If you are into history make sure to explore Fort Mackinac. There’s fun shopping and there are two golf courses to enjoy. 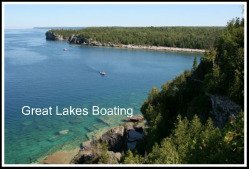 INSIDER TIP: A wonderful website to learn more about Great Lakes boating adventures is the Great Lakes Cruising Club. Become a member to keep abreast of all the exciting ports of call in northern Michigan. Return to Home Page from "Great-Lakes-Boating"